Just Write, Heather: Hey Noggin, Are Ya Kiddin' Me? Hey Noggin, Are Ya Kiddin' Me? With rain and thunderstorms all this week, we've spent a great deal of our time inside. There's only so many crafts a girl can do before she starts drinking crying. When Brother decided to use a whole bottle of Elmer's glue in one sitting and then throw a huge fit because his paper was stuck to the table, I knew we needed a different kind of fun. I turned on Kid's TD (that's children's television programming to those of you untrained by Brother's cuteness) and looked for something that would entertain the kids without driving me to drink cry. We settled on Noggin and all of a sudden there was a strange man in a fuzzy orange hat before us. The show? Yo Gabba Gabba. For those of you familiar with the show, you may stop singing, "There's a party in my tummy! So yummy! So yummy!" now. Please. The show itself is a little on the odd side but what really grabbed my attention wasn't the life size creepy looking fuzz balls singing and dancing. Oh how I wish that was it. No. It was a segment of the program called "Biz's Beat of the Day." I thought I had dozed off and flashed back to my childhood. After all, I could use a nap. On my screen was Biz Markie of 80's rap fame. The man we all know of "You Say He's Just a Friend" fame is now on a kid's show. (What? You don't know him from his illustrious rap career? Don't make me pull out my 80's Hip Hop Greates Hits CD.) 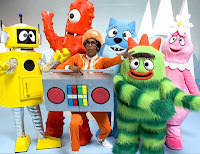 His part on Yo Gabba Gabba is.....interesting? Laughable? I don't know, I'll let you decide. From what I gathered today, Biz teaches kids a beat box rhythm each day and asks them to practice at home. I'm guessing the market for old school rap isn't what it used to be. But Biz has a plan. A secret plan to teach all of today's preschoolers beat box in hopes that 80's rap will make a come back in a few years and he'll be held as their icon. Whatever the case, I'm sufficently entertained for today. Also? If it's raining tomorrow, I'll settle for more fun with Elmer's. Elmer's fumes can't be as harmful as Biz's beat box.